BRESLAU, Ont. (May 24) –British based K-tech Suspension’s North American distributor, Orient Express Racing has designated Canadian motorcycle tuning company Fast Company R&D as the official sales and service agent for Canada. Fast Company’s immediate plans will also include trackside support for Fast Company/K-tech customers at all rounds of the 2011 Canadian Superbike championship by Parts Canada. Fast Company owner Scott Miller has 32 years of experience in the motorcycle tuning business and has been running factory road race efforts as far back as 1993. He will attend all seven rounds of the Canadian Superbike Championship starting with this weekend’s season opener at Circuit ICAR in Mirabel, Que. Miller has been behind four national championship efforts in Canada, taking Szoke to Canadian Superbike titles in 2002 and 2010, winning a national Open Sport Bike crown with Francis Martin in 2002 and the 2010 Pro Sport Bike Championship with Szoke. He has also been in the winner’s circle with racers like Crevier, Lacombe, Linnley Clarke, Andrew Nelson, Neil Jenkins, Mark Kowalski and Fritz Kling. Additionally, Fast Company has won or shared in four top tuner awards in the national Superbike Championship – the Nelson Rae Tuning Achievement Award in 1994 and the Inside Motorcycles Team/Tuner of the Year Award in 2001, 2007 and 2010. Szoke will again use K-tech components on his Competition Systems Kawasaki Race Team Kawasaki ZX-10R in this summer’s Canadian Superbike Championship by Parts Canada. Last year’s Canadian Superbike Championship runner-up Nelson will also use K-tech products on his BMW S1000RR in this year’s series. Both Szoke and Nelson will run the 20DDS fork cartridges and 35DDS rear shocks. Six-time Canadian Superbike champ Crevier will also be K-Tech-equipped on his Deeley-Harley-Davidson Canada XR1200 Cup entry. Based in Breslau, Ont., Fast Company is a road race shop equipped to build your motorcycle from start-to-finish in-house. For more information call (519) 648-3832 or email fast.co@sympatico.ca. For more details on K-tech Suspension and its products go to http://www.k-tech.uk.com. 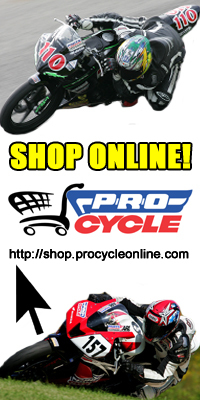 More information on the Canadian Superbike Championship by Parts Canada is available at http://www.csbk.ca. Posted on May 24, 2011, in CSBK - Canadian Superbike Series. Bookmark the permalink. Leave a comment.